In its simplest form, this set-up box includes a base and a sleeve. 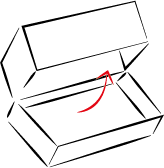 A simple box with a base and a lid, with or without a sleeve (fragrance). This box comprises a base with one or more sliding drawers (For wines and spirits or accessories). This box comprises a base containing one or more trays that allow the protection of products during storage or their display in store (For product ranges or promotional offers, for example). Delivered flat, this collapsed box becomes a set-up box in an instant. It is ideal for gift sets or promotional offers at the point-of-sale. Alliora Coffrets now offers this technical solution even for large production runs. Made to measure with original shapes and dimensions, including the production of bespoke molds.